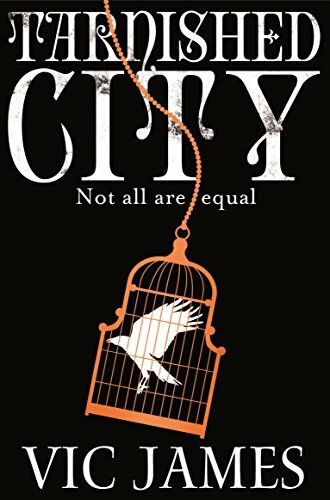 A thrilling Orwellian vision of Britain, with a rebellious Hunger Games heart, Tarnished City is the second title in Vic James's electrifying Dark Gifts Trilogy, following Gilded Cage.Rebellion is in the air, but change comes at a cost. Luke is being held prisoner, his sister Abi is a fugitive, and the Jardine family have seized control of Britain. New alliances and old betrayals will remake the country, leaving Luke and Abi questioning everything - and everyone - they know. Meanwhile Silyen Jardine dreams of a power even greater than his tyrant father's - the forgotten Skill of the Wonder King . . . Tarnished City is the second book in Vic James‘s fantasy series The Dark Gifts. The first book, Gilded Cage, was a book that will stay with me for a fair while. It did take me a chapter or two to get back into the bigger story in this one. It is probably best not read standalone as there is much in the way of background to this book in the earlier one. Once again this book concerns the Equals who use magic to wield power over the common folk and the struggle between them in an otherwise recognisable England. reading. Increasingly you see them as highly polarised between those who wish to maintain or enhance/enforce the status quo and those who may have ideas about liberal change. Among the common folk the Middlemoor gang from the last series are back and are still activists. The book overall sees a heightening of tension and increasing wielding of power and violence. I was blown away by the first book – does this one have that taught edginess? Pace is definitely there – “I’ll just read one more chapter!”. However I didn’t find this book as consistently compelling as the previous book and I’m trying to pin down why. Maybe Abi is a weak link here for me. Most people in this are nasty/scheming or wanting to change the system. Abi is simply trying to get Luke back. Parts of her story seemed weaker to me. In general the main characters have had something of a rollercoaster ride in my opinion. While Abi’s story might seem weaker, Silyen – something of a background character in the first book relatively speaking – becomes far more interesting. I’d argue that, while his role as a main character is brief compared with others, Gavar is also far more interesting than he was. Other new characters also come through well. In the end I found some parts very good indeed, others storylines I found didn’t quite grab me. The author has become nearly as ruthless as some of the Equals – there are some surprises or even shocks in the course of this book. The ending was powerful and interesting – a cliff hanger again. For me this is a 3.5/5 book however happily rounded up to 4. Those who read the first book will certainly want to read this and I doubt they will be disappointed. I’d certainly want to read book three.